"It's heaven!" Alejandro G. Iñárritu and Darren Aronofsky both present (for US release) the latest film from Swedish filmmaker Roy Andersson, titled A Pigeon Sat on a Branch Reflecting on Existence. This not only wins the award for best film title of the year, but it's also one of the most original and visionary creations I've seen, unlike any other cinematic work out there. The film premiered at Venice & TIFF last year (where I saw it) and earned mostly positive reviews, so fans of Andersson have nothing to be worried about. 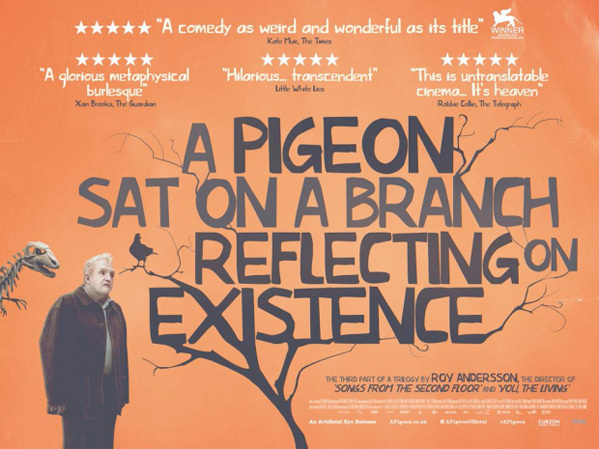 A Pigeon Sat on a Branch Reflecting on Existence is a movie about "being a human being", exploring abstract ideas and concepts connected to existence. It's an absurdly masterful head trip worth experiencing. Like his previous features Songs From the Second Floor and You, The Living, master Swedish director Roy Andersson takes up the theme of "being a human being" with this meticulously crafted, dreamlike black comedy. Sam and Jonathan, a pair of hapless novelty salesman, take us on a kaleidoscopic tour of the human condition in reality and fantasy, unfolding in absurdist episodes: a sing-along at a 1940s beer hall, a randy flamenco teacher, a thirsty King Charles XII of Sweden en route to battle, and a diabolical metaphor for the horrors inflicted by European colonialism. It is a journey that unveils the beauty of single moments, the pettiness of others, life’s grandeur, and the humor and tragedy hidden within us all. Roy Andersson's A Pigeon Sat on a Branch Reflecting on Existence will arrive in select theaters June 3rd. My interest is piqued. Guess I'll check this one out. I will see this. Looks like a barrel of monkeys. This looks nice, A piece of Scandinavian sarcasm. Why not?